Well, we survived and made it back but it was all a bit of an ordeal. It started well; we drove down to Somerset on the Tuesday evening and stayed at a great pub, The Manor House Inn, in Ditcheat just a few miles from the festival site. We had a great meal and a few pints of local cider and got our last night of comfortable sleep for a few days. The next morning we drove over to the festival site, but despite it only being a few miles away, and us starting off at 7:30am, we didn’t get onsite until around 9am. As we unloaded the car we noticed that something had clipped the car in while it was parked outside the pub and broken the rear light cluster. As there was mud on the light, it looks like it was probably a tractor that did the damage. We loaded up our new sack truck with the tent, some food and various other bits and pushed it out of the car park and down the hill to Pedestrian Gate C. From there it took another 45 minutes to an hour of pushing the truck before we got to our chosen camping area, in the top of the Dragon Field next to the Sacred Space (where the stone circle is situated). The field was already pretty full, despite the gates only opening at 8am apparently there were 77,000+ festival-goers onsite by 9am. We found a reasonable pitch close to the stone dragon and set up the tent. As with most new tents, this turned into a bit of a mission, mostly because we were fairly constrained for space and the new awning seemed to be too large to fit the tent. After a couple of hours of puzzling and grumpiness we got it sorted out and had a sit down in our shiny new folding chairs. The weather forecast had been pretty gloomy for the week but Wednesday was pretty pleasant, not too hot and no rain. We trundled down to the main festival and had a couple of ciders and some food to get into the swing of things. Around 8pm we met up with a whole bunch of people from Urban75, and it was nice to meet some familiar faces as well as to meet lots of new ones. By that point, we’d had a few ciders though so I can’t honestly remember everyone I met, though I do recall meeting Aqua, Editor, Dubversion, Pie-Eye, JTG, BlueStreak, Eme, felixthecat and beesonthewhatnow. My apologies to anyone I met who I can’t now recall. It was a bit of a night. Getting back to the tent after several more culinary indulgences, we discovered some of the downsides to being so close to the Sacred Space and the dragon; people stay up all playing bongos and shouting. And we were close enough that we could hear everything very clearly. The next morning, Thursday, the rain started. It wasn’t too bad initially but quickly turned the path through the Dragon Field into a dangerously slick mudslide. By Thursday night people were sliding off the path into tents. 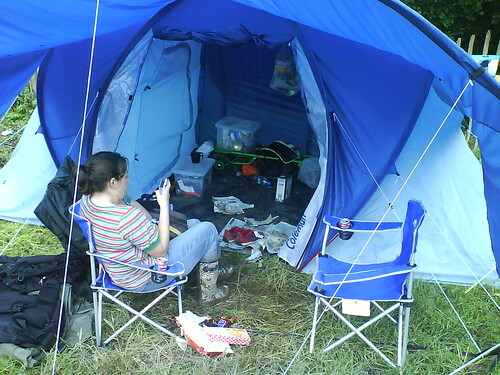 Fortunately our tent was on a fairly level bit so we weren’t as badly affected but it all started to get very messy. I won’t go into great detail about the rest of the festival. We didn’t really see many bands, and by Saturday the site had become so muddy and waterlogged that we decided to start packing. After one trip to the car, the rain eased off so we stayed over Saturday night as well, but once again Sunday morning arrived with the sound of rain rattling down on the tent. Looking back I’m very glad that we did leave on Sunday, from what I’ve heard getting off the site on Monday was a nightmare. Some of the acts that we did see: The Zen Hussies (great jazz on the Bandstand), Alloy Mental (slightly disturbing dance stuff), Hearin’ Aid (hip-hop), The Cribs, Modest Mouse, Urban Myth Club and !!! (pronounced ChkChkChk), Good Shoes, A Guy Called Gerald, and Men in Masks. We heard quite a few other acts either from our tent or as we were wandering around. 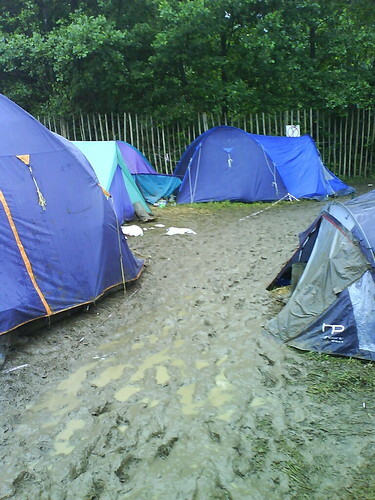 Here’s a collection of my Glastonbury 2007 photos and below is a short video clip showing the mud around the Cider Bus area taken on Saturday evening. Lorna and Dan’s wedding went off very well. 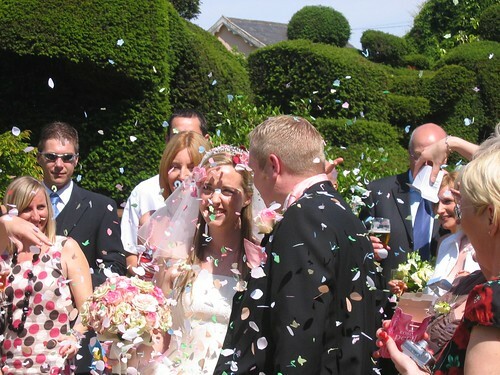 The weather forecast was a bit foreboding, but it turned out to be wrong and everyone enjoyed a beautiful warm, sunny day at the Cornwallis Country Hotel. Lots of pictures available at my Flickr gallery. The next day, both Vic and I were pretty badly hung-over, and as is often the case when in that state, we made the unfortunate decision to try a different route to get home. After several wrong turns and a quick trip through Southend we made it home more than two hours later. That did include a recuperation break at a service station though. The next day, Sunday, I was flying off to Seattle, WA for an IBM/Microsoft Study Tour, so it was a relatively early start and off to Heathrow to meet up with my half of the party at noon. A 9 hour flight and an 8 hour time difference ensured that I was absolutely shattered by the end of the day. The two study days in Seattle were pretty intense, but informative. Presentations from Microsoft on the Monday and IBM on the Tuesday, excellent meals each evening and a few hours to have a look round Seattle. We also had a few hours on Wednesday morning before setting off back to the airport at 2pm. 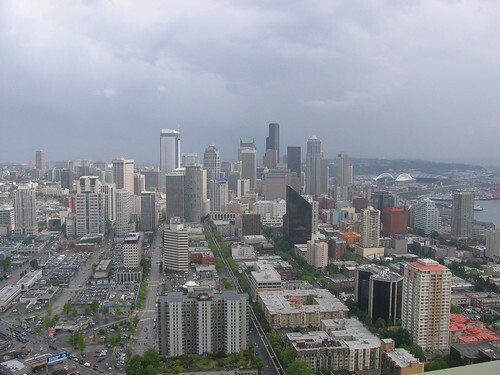 I managed to visit the Space Needle and Pike Place Market and took a few photos. Arrived home completely exhausted and it took a few days to recover any semblance of normality. Now we’ve got Glastonbury just around the corner, next week. The tickets have arrived, we’ve got a shiny new tent, a sack truck to carry stuff with and the weather forecast is looking decidedly dicey. Fingers crossed…. (but I’m packing my waterproofs).